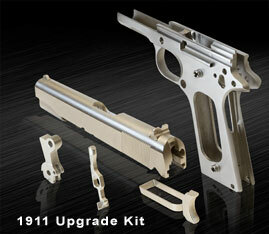 UCT Arms Introduces 1911 Pistol Upgrade Kit and Offers EXO Technology Coating Service for Personal Firearms | DefenseReview.com (DR): An online tactical technology and military defense technology magazine with particular focus on the latest and greatest tactical firearms news (tactical gun news), tactical gear news and tactical shooting news. Stuart, Florida — UCT Arms, LLC introduces its latest product under the FailZero brand of tactical upgrades. The FailZero 1911 kits, featuring EXO-coated Caspian slides and frames, provide consumers the foundation from which to build a highly reliable, lube-free-for-life firearm, or an opportunity to replace existing components with EXO™-coated components. This 1911 kits joins the AR15 and M4/M16 Basic and Extreme Kits in the family of FailZero products. FailZero tactical weapons upgrades optimize firearm performance and feature EXO Technology. EXO Technology provides a hard, durable surface (40% harder than Chrome) and permanent lubricity to metal substrates, allowing firearms to operate without oil or grease. EXO-coated components last longer, clean up easier, and require minimal maintenance, while increasing reliability in harsh environments (sand/dust, hot/cold, suppressed fire, frangible ammunition). UCT provides a lifetime warranty on the coating and a 30-day money back guarantee if, for any reason, the FailZero products do not meet your expectations. OEM and Consumer Coating Now Available! UCT Arms now offers coating services for OEM platforms and Individual Firearms for consumers. We coat all types of firearms such as pistols, shotguns, bolt action rifles, AR15/M4/16 style rifles, and magazines. Call 866 214-6926 or email [email protected] for a price list. EXO Technology is a patented, nickel-boron coating from UCT Coatings, Inc., parent company of UCT Arms, LLC. EXO has been specified for use by the DoD and Federal Agencies in several weapon systems and is in use across many industries such as oil/gas, forestry, ball valves and pumps, and performance automotive. It is applied at our ISO 9001:2008 registered facility in Stuart, FL using Six Sigma processes.